This is Gayatri here hijacking Winnie & Walter Blog today. I have another bold and bright card to share. This card uses the Cover Model: Multifacted Cutaway. But first, here is my card. For my previous card this month, I sponged a white cardstock panel in rainbow colours and die cut using Cover Model: Multifaceted Cutaway. I used the negative triangle die cuts from the die on my card. And I was left with the positive die cut. So for today’s card, I am using that positive die cut. I trimmed off the edges of the Multifacted die cut and adhered on a black card base by applying glue to only the centre of the die cut. I wanted the edges to be raised to give dimension. Love love the contrast of the rainbow colours against the black background. 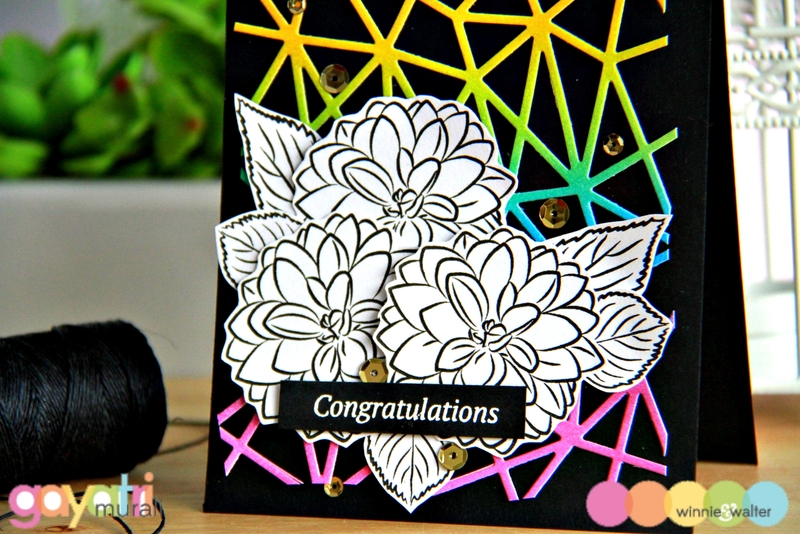 For the focal point, I simply stamped the Dahlia flowers and leaves from In Bloom: Addie’s Garden stamp set on white cardstock in black ink and fuzzy cut them out. I clustered and adhered the flowers and leaves on the card front. Black and White flower cluster lets the rainbow colour pop yet adding subtle attention to it. Sentiment is from Parentville Extras stamp set which I simple white heat embossed on black cardstock and adhered. Finally embellished with some gold sequins from Pretty Pink Posh. So get more out of your dies by using both the positive and negative die cuts to make two totally different cards. Love the way you've accented the negative, now used the positive of this wonderful die, Gayatri! I also love that you've left the flowers in their black and white state of gorgeousness! Thanks for the inspiration! What a cool idea to put the color in the background and the black and white images up front!! It makes for a stunning effect!! Awesome!! Gasp, WOW, I sure do LOVE this card, Gayatri!! 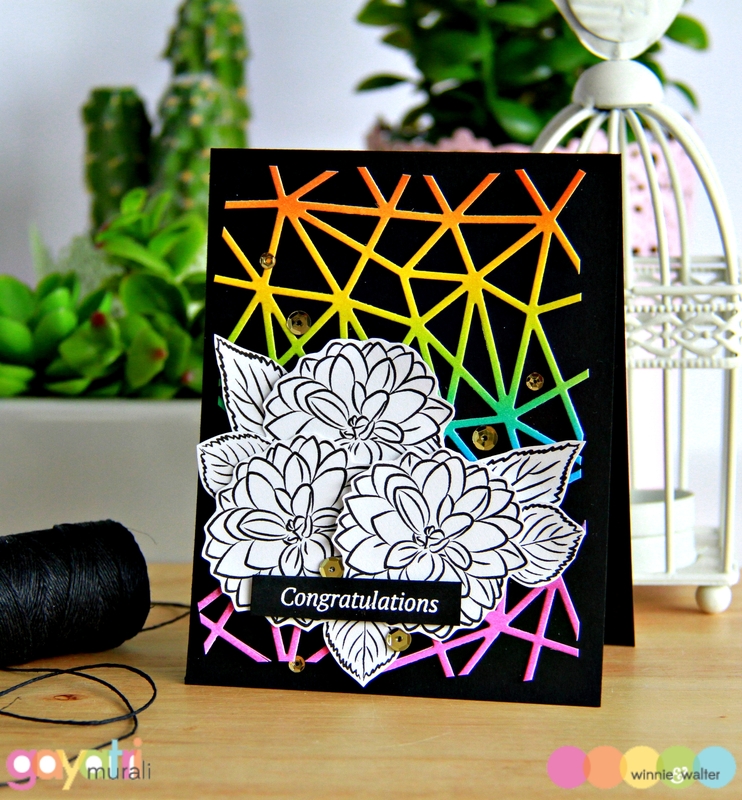 The background you created with the faceted cover plate and black base is absolutely stunning, and is the PERFECT backdrop for those gorgeous white flowers! You've outdone yourself her, m'dear! Your background is so stunning! Love how the colors are really prominent behind the black and white flowers! Brilliant card, love how you ised theegative of the die. Just waiting for mine to come home to mama so I can go for it. Beautiful layout. The contrast of the B&W flowers is lovely too!!! Gorgeous card, Gayatri! Love the bright colors with the B&W. The colourful mutlifaceted die cut is a stunning backdrop for the lovely black-and-white flowers. A gorgeous eye-catching card! I loooove this card! A stunner!